With a small staff and a wealth of dedicated volunteers, the DNR's Marine Turtle Conservation program is working to protect these ancient creatures. Editor's Note: Sea Turtle Network volunteer Sue Haberemeier was kind enough to share with SCW magazine journal entries detailing her experiences during the 2008 and 2009 nesting seasons. What follows are direct excerpts from those journals. 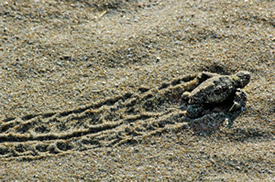 2008 Season: The Story of Our Nest: "Just Add Music"
One of the local Garden City volunteers was making her sunrise dog walk, looking for turtle tracks as she did every morning. She spotted tracks on a very low part of a dune. The mother turtle laid her eggs in an unsafe part of the beach, so she called Jeff McClary of SCUTE, and he made arrangements to relocate the nest to our dune which was higher and safer. Our grandchildren watched as they dug a new nest. They covered the nest and marked it, and we began our job of monitoring it for the next two months or until hatching. Our daughter Laura was checking the nest and found a change in the surface. It looked like two small bubbles had come up. . . . It was the first day of the normal range of hatching. Little turtles began to peep out at 7:28 p.m. At about 7:45 p.m. the first one poked out its head and flippers, then it emerged from the nest, paused, looked left and right as though checking for traffic and then started down the sandy slope toward the ocean. It walked as far as the gray PVC pipe that held the orange diamond sign of the DNR turtle nesting site, and looked up at the top of it, and then walked around it and continued toward the sea. A few seconds later about six turtles tumbled out. Then, as if a New Orleans jazz band broke into a loud version of "When the Saints Go Marching In," the full boil of thirty something turtles erupted from the nest. A mad scamper toward the ocean had the crowd of turtle watchers spellbound. The turtles were all safe in the ocean by about 8:20 p.m.
Once in the water, the first couple of waves washed the tiny turtles in and out again, but then they caught their proper aim into the current. We watched as they came up for air a couple of times showing their little black heads for a moment, and then they were gone - into the ocean at last. I was invited to attend the inventory of the rare leatherback sea turtle that hatched at Myrtle Beach State Park. The mother nested at Garden City Beach just a few houses down from us, in the middle of the day around July 4th! Since it was a holiday, the beach was full of people. Later I heard that she laid about forty eggs and about nineteen spacers. The naturalist estimated that she weighed about 1,100 pounds. The officials moved the nest immediately to the state park to be monitored. Her tracks were very wide and the nest was much deeper than the loggerhead nests. 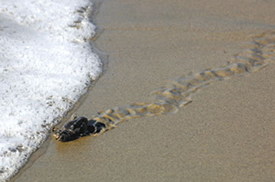 During the inventory we were very lucky to see one hatchling make its way to the sea. As we expected, the hatchling was much bigger than the loggerhead hatchlings. When the naturalist held it up for us to get a close look, it more than covered her palm as she held it diagonally and appeared to be about four inches long and about two and a half inches wide, with a flipper spread of about seven inches. This was a very exciting day. My husband and I picked up our granddaughter so we could take her to the turtle release on Sunday, July 26, at Beachwalker Park on Kiawah Island. It was a long drive, but it was worth it. It was thrilling to see the two Kemp's ridleys and one loggerhead go back to the sea after their long hospital stay in Charleston. Hans and I went to the inventory of a sea turtle nest at Litchfield Beach. The sunset was around 7:43 p.m. Walking up to the nest, we noticed two black spots at the nest bowl. About thirty minutes later two heads were visible. Later four heads, then later six heads and a flipper could be seen. By now it was really dark and around 8:20 p.m. The first little hatchling slowly came out of the nest, climbing up the forty-five-degree slope in very dry sand. It would climb a little and rest a little, standing on the back of the one below it, pushing to get out of the nest. As each hatchling got out, the next one began the same struggle to break free of the sandy nest. A small boil of six or seven followed. Then steadily they came out in ones and twos until twenty five were on their way to the ocean. Happy Birthday to my grandson and to the little hatchlings! By the time we got there, the nest managers had expanded the ropes around the nest so that the entire crowd would be able to see what was going on and other ropes were in place for a possible "run" to the sea. It was a large group. Nine hatchlings were released to the thrill of the crowd. Nine or ten died or did not develop. One hatchling kept going for the sunset, but then the volunteers blocked the sun and the turtle went to the sea. A seventy-day nest; only four eggs died, all in the shell. As with all inventories I have attended, there is an ongoing mini-lecture about a sea turtle's life, as well as what is going on during the digging process. I always learn something new from each nest manager's message which is usually thirty minutes of good information. 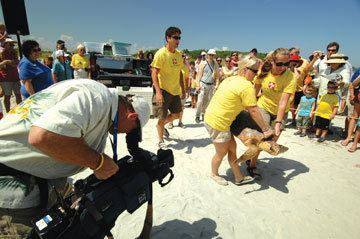 As the turtle season ends, I am looking forward to a busy season in the spring of 2010. Each time I attend a turtle event, I learn more and realize I have only begun to scratch the surface of what is to be learned about these fascinating creatures. Special thanks to SCUTE volunteer network member Sue Haberemeier for sharing her exciting sea turtle experiences with us through her volunteer diary. Sea turtles have a sort of superstar status in the conservation world. In South Carolina alone, over eight hundred coastal residents volunteer with the S.C. Department of Natural Resources' Marine Turtle Conservation program each nesting season, an effort worth hundreds of thousands of dollars. Sea turtles have been referred to as "the poster children of environmental conservation," according to Dubose Griffin, who became the program's coordinator in 2006. These ancient reptiles, dating back 210 million years, possess a special quality that inspires people to take action and creates a deep sense of fulfillment - and wonder - for those who witness their journey. From May through August each year, female sea turtles that have traveled hundreds or possibly thousands of miles from their feeding grounds to the nearly 185 miles of South Carolina coastline swim slowly back and forth, just beyond the breakers, in search of a safe place to come ashore and lay their eggs. Octavia Sola, an intern who spent the 2009 nesting season on South Island, part of the DNR's Tom Yawkey Wildlife Center Heritage Preserve, is familiar with the turtles' terrestrial journey. South Island, an undeveloped coastal wilderness preserve, offers a quiet, dark place for turtles to nest. Octavia said her favorite part of working on South Island "was getting to work with the people from the DNR's sea turtle program and being a part of the crucial conservation work they do." Engaging with others who have turned their passion for threatened and endangered sea turtles into a career inspires her to do the same. At night during the 2009 nesting season, Sola loaded up her equipment - predator screens, stakes, record sheets and mosquito spray - and drove an old state-issued truck down the island's overgrown paths to the beach to patrol for turtle tracks. While many nest protection projects patrol at first light, night patrols are a necessity on South Island because of heavy mortality to nests by predators, primarily coyotes. At the first site of tracks, Sola would cut the lights and engine; if the located female turtle was still in the process of laying her eggs, she would wait quietly until the task was completed and the turtle returned to sea. "It is difficult to put into words the emotions I felt when I saw a nesting female turtle emerge to lay eggs," she said, "To see this ancient creature come ashore was awe inspiring." On the night I joined Sola for her rounds at South Island, we watched a large female loggerhead crawl slowly up the beach, each scrape of her flippers leaving a trail of sparkling green light in the sand (the result of bioluminescent algae). The turtle slowly made its way towards the dunes and began to dig a cylindrical, inverted light bulb-shaped hole about twenty inches deep. We were able to get close enough to see the leathery white eggs, each about the size of a ping-pong ball, falling from her one by one. Each loggerhead nest contains an average of 120 eggs, and a single female repeats this nesting ritual about every thirteen days, or an average of about four times in a single season. With an output of over five hundred eggs a season, loggerheads will only return to nest again every two to three years. Once the turtle we encountered at South Island was back at sea, we retuned to the freshly created nest and began to stake down the screen that would protect the eggs from coyotes and other predators, including raccoons, foxes and ghost crabs. In the best-case scenario, about sixty days later (between July and October) the eggs would hatch and about 120 tiny hatchling turtles would boil up to the surface to make their way to the ocean. "The job I did this year at the Tom Yawkey Wildlife Center played an important part in making sure that large, healthy nesting females return to South Carolina beaches for many years to come," said Sola. Sally Murphy, a retired DNR biologist who coordinated the Marine Turtle Conservation program for over thirty years, explains that scientists do not know for certain how the turtles choose their nesting sites, but it appears that they make their decisions based in part on topography and the amount of light and movement on a beach. Loggerhead sea turtles (Caretta caretta), which make up 99 percent of the nesting population in South Carolina, weigh 250 pounds on average; and while they may glide gracefully through ocean waters, their movements on land are extremely laborious. Murphy described her emotions when witnessing hatchling turtles during their first day of life as "relief and gratitude for them making it this far, and a motherly apprehension for what they face in that huge, dangerous ocean for the next thirty years." Murphy said she will always remember the look of amazement and joy on her then three-year-old grandson's face when he first saw hatchlings going to the water. After spending just over thirty years reaching maturity in the ocean, loggerheads are ready to begin mating, and many return to the region where they were hatched to begin the cycle anew. Loggerheads can be found in warm, tropical and temperate waters around the world, but the southeastern United States is one of their primary nesting areas. The DNR reported over three thousand loggerhead nests on the South Carolina coast during the 2009 nesting season; other species that make occasional appearances are the green sea turtle (Chelonia mydas), Kemp's ridley (Lepidochelys kempii) and leatherback (Dermochelys coriacea). The loggerhead, green sea turtle and olive ridley (Lepidochelys olivacea) were listed as threatened species under the U.S. Endangered Species Act in 1978; the Kemp's ridley, leatherback and hawksbill (Eretmochelys imbricata) were already on the list. Federal grants available under the act allowed South Carolina to start a program to protect loggerhead nests and identify sources of mortality causing their decline. South Carolina was among the first group of states to sign cooperative agreements with the U.S. Fish and Wildlife Service and the first state to sign a similar agreement with the National Marine Fisheries Service. But long before sea turtles were listed under the Endangered Species Act, William "Bill" Baldwin, a biologist with the USFWS, and his assistant John Lofton were on the beaches of Cape Island, working to understand and record turtle nesting. The two men wrote the first scientific work on sea turtles in North America in 1940, titled "The Loggerheads of Cape Romain." In 1977, Murphy began her work with sea turtles on the South Carolina coast at Yawkey and Cape islands. She spent her first three years recording nesting data using many of Baldwin's techniques, and what she discovered was that only 7 percent of the nests were surviving. Murphy began flying aerial surveys of the coast once a month to document "strandings" (turtles washed ashore) in areas that could not be monitored on foot. She also began to test management options such as predator screens, raccoon trapping and nest relocation, which increased nest productivity to over 80 percent. 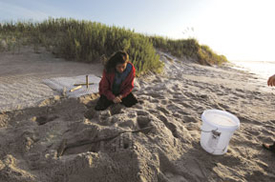 As volunteer nest protection projects were initiated along the coast, staff and volunteers implemented these techniques, which are still used today. In 1979, the USFWS and the National Marine Fisheries Service appointed Murphy and turtle expert Peter C. H. Prichard co-leaders of the first national turtle recovery team. 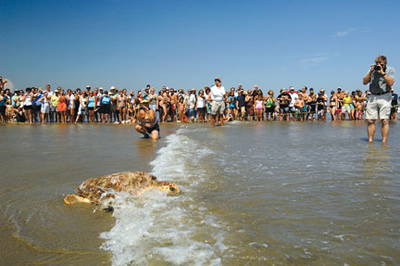 The team's first goal was to create a regional stranding network to collect standardized data on sea turtle mortality. Two other pioneers of sea turtle conservation contributed to the efforts on the South Carolina coast in the late 70s - Tom Murphy, the DNR's first nongame biologist, and technician John Coker. The two men carried out innovative sonic and radio telemetry research, and discovered that female turtles travel up and down the coast near the shore during the nesting season, increasing their chances for conflict with commercial shrimp boats. The DNR's Marine Turtle Conservation program consists of four major components: basic research to determine what actions are required to protect turtles; management to implement these actions; long-term monitoring to determine the effects of this management on the population; and public education and outreach. 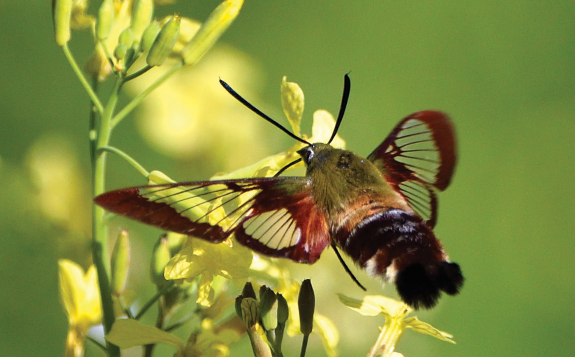 The program is managed by a surprisingly small number of full-time staff members: biologist and program coordinator DuBose Griffin, biologist Charlotte Hope and seasonal biologist Kelly Sloan. Their responsibilities include issuing permits; working with various government agencies and private groups; monitoring nesting and stranding trends; and training volunteer network participants to locate and relocate nests (when necessary), protect the nests with predator-proof screens, monitor nests during incubation and inventory the nests after the hatchlings emerge. Each spring Griffin, Hope and Sloan provide support to project leaders who oversee the activities of the hundreds of coastal volunteers who are the foot soldiers of the twenty-one nest protection projects overseen by the DNR. The number of volunteers has grown from around fifty in the early 1980s to over eight hundred in 2009. "There would be no Marine Turtle Conservation program without you," Griffin told a room full of volunteers at an appreciation dinner hosted by the DNR, "and that's a fact." Despite the good work done by the program's professional staff and volunteers, from 1977 to 2009 nesting numbers in South Carolina declined 1.9 percent each year. A bright spot in this long-term trend was a strong 2008 nesting season - the seventh highest season on record since 1980. Nesting numbers in 2009 included an estimated 3,233 loggerhead nests, as well as three confirmed leatherback nests and one green nest. The "Loggerhead Biological Review Team," a national group of marine turtle experts under the auspices of the NMFS, concludes in their latest report that the Northwest Atlantic Ocean Distinct Population Segment (which includes loggerheads nesting in SC, NC, GA and FL) is currently at risk of extinction. 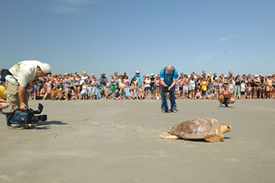 In the DNR's 2009 "State of South Carolina's Coastal Resources: Loggerhead Sea Turtle Update" scientists emphasize that the maintenance of protection for sea turtles, both on land and at sea, is critical for their survival. Carrie Young is a former researcher for National Geographic magazine.